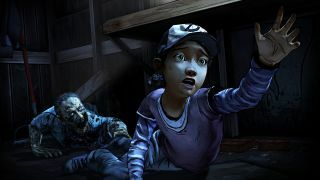 The next five episodes of Telltale's The Walking Dead series will be played as Clementine, the child taken in by previous lead Lee Everett, according to today's reveal. The Walking Dead: Season Two is "expected to premiere later this year," and continues Clementine's story from her point of view as she's "left to her own devices to seek safety and survive in a world gone mad." "Now assuming the role of an ordinary child, players will struggle to outwit both the dead and the living in situations that will test their morals and control the flow of the story through their decisions and actions," reads the press release. It's possible we actually play as some other ordinary child, but that would be a pretty cruel bait-and-switch even by Telltale's standards. So we're in Clementine's more vulnerable shoes now, which should introduce unprecedented storytelling decisions to the series as we confront moral obstacles from a child's point-of-view. Streamlining the catching-up process, Telltale has also announced The Walking Dead: Game of the Year Edition, which will include the original five episodes from Season One , the 400 Days DLC , the original score, and a behind-the-scenes video for $30 USD "or equivalent." That'll be out sometime next month. Meanwhile, Season Two is up for pre-order on Steam now, and the first episode should be out before next year. Check out the teaser trailer above, and a bunch of screens below.